An artist’s model of a quasar shows the hot disk of gas and dust rotating around a central, supermassive black hole. The magnetic field of this system is so powerful that particles from the disk are carried up and out of the system by the strength of the poles. Quasars are cores of galaxies where a supermassive black hole is messily feeding. Orbiting gas and dust whip around the black hole with such ferocity that they give off light in all wavelengths. The magnetic field of the powerful black hole traps particles from this spinning disk and expels them along its poles. We see these polar fountains as gigantic jets in radio waves and X-rays. Even across long distances, the cores of these galaxies shine like stars, which is why they were first given the description of quasi-stellar (kinda like a star) radio sources, or quasars. However, quasars are speeding away from us, something a star in our Galaxy would not do – we’re all in the same Galaxy, so we more-or-less move together in this spinning disk. Only distant galaxies speed away from us so quickly; therefore, the quasars must be distant galaxies with extreme brightnesses. They reign as the most luminous objects in the entire Universe. Supermassive black holes appear to act like gravitational hubs in the cores of all galaxies. 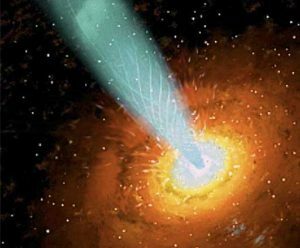 Weighing in at hundreds to a billion times more massive than our Sun, these giant black holes grow at an alarming and seemingly impossible rate. In fact, the origin of the most enormous black holes remains a mystery doggedly investigated by astronomers and physicists around the world. Radio telescopes see about 10% of the known quasars, but provide much of the detailed information that helps us to understand them. For example, the Very Long Baseline Array, the highest-resolution full-time telescope in the world, allows us to watch individual bursts from the supermassive black holes and make films over time of their activities.